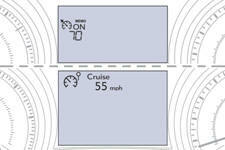 Peugeot 208: Cruise control "CRUISE"
Peugeot 208 / Peugeot 208 Owners Manual / Instruments and controls / Driving safely / Cruise control "CRUISE"
1. 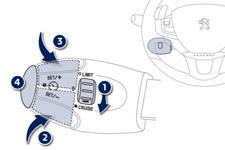 Selecting cruise control mode. 2. Decrease the programmed value. 3. Increase the programmed value. In order to be programmed or activated, the vehicle speed must be higher than 25 mph (40 km/h), with at least 4th gear engaged on a manual gearbox (2nd gear on an electronic or automatic gearbox).